The President's Photographer premiered November 2010. Follow the President's photographer inside the Obama White House. As the 44th president's chief photographer, Pete Souza is never far behind President Obama. Follow Souza, and those who came before him, for a behind-the-scenes look at the American presidency. For 50 years, presidential photographers have covered it all: upheaval, tragedy, joy — often developing friendships with the presidents they serve. Acting as both visual historians and key links between the public and the presidents, for these photographers no day is the same — whether they are aboard Air Force One, backstage at the State of the Union or in the heart of the West Wing. As the 44th president's chief photographer, Pete Souza is never far behind President Obama. Now in the National Geographic Special, The President's Photographer: 50 Years in the Oval Office, viewers can follow Souza, and those who came before him, for a behind-the-scenes look at the everyday grit of the American presidency. Offering a chance to see what it's like to cover the most powerful man in the world, for history. 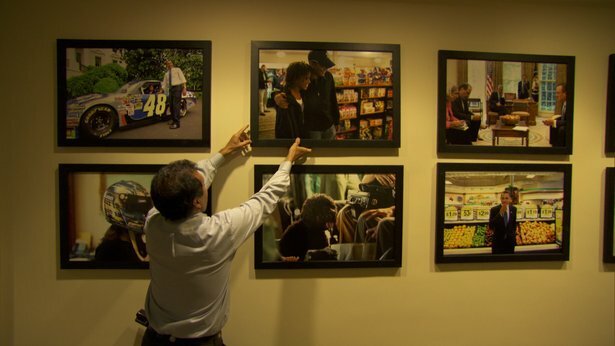 Pete Souza hangs photos in the White House Gallery. These images, called, "jumbos" hang throughout the West Wing of the White House. The presidential photographer's job is two-fold: one, taking photographs of the president greeting dignitaries, visitors and guests; and two, perhaps more challenging and gratifying: documenting for history every possible aspect of the presidency, both official events, backstage happenings and "off-duty" private moments. "Creating a good photographic archive for history is the most important part of my job, creating this archive that will live on," says Souza. "This is not so much photojournalism as photo-history." Souza and his staff produce up to 20,000 pictures a week. The movie offers a fresh and candid viewpoint on life and work behind the famous façade of 1600 Pennsylvania Avenue. In rare interviews, Souza and four veteran presidential photographers — David Hume Kennerly (Gerald Ford); David Valdez (George H.W. Bush); Bob McNeely (Bill Clinton); and Eric Draper (George W. Bush) — tell insider stories about photographs that reveal what presidential speeches, press conferences and posed images often cannot. Their personal anecdotes illuminate the many pleasures and pressures of their job. "The job of presidential photographer is all about access and trust, and if you have both of those you're going to make interesting, historic pictures," Souza says. He earned the President's trust by following Obama on his rise to the Presidency covering then Senator Obama as a photographer for the Chicago Tribune. Souza, like all the other photographers who have held this post, cites Yoichi Okamoto, President Johnson's photographer, as the gold standard. Okamoto, known as "Oke", had unparalleled, and unfettered access to President Johnson. Only Oke and LBJ's appointments secretary were allowed to walk into the Oval Office whenever they wanted. Okamoto's coverage reveals the benefits of such access with a body of work that shows the president in every imaginable phase of his work — cajoling senators, pondering pros and cons of issues, even examining one of his dog's illicit deposits on the Oval Office carpet! Not every photographer has had such access. President Nixon's photographer, Ollie Atkins, had very limited access to the president. All picture opportunities had to be cleared with the press secretary. As a consequence our visual history of the Nixon administration is dominated by official photos — what the photographers call, "grip and grins". Although, for pure irony, it's hard to top the grip and grin featuring the President with Elvis. So far, eight professionals have served as Chief official White House photographers for any significant period. Their images, from September 11th to Kennedy's assassination, have become icons that can also serve as a visual tools to help future historians understand what went on during a particular presidency. To a documentary photographer, like Souza, every presidency has defining stories, and those images are often how we remember a president. For Johnson, it was civil rights and Vietnam. President Reagan is forever tied to the end of the Cold War. President Clinton pursued peace in the Middle East. History has yet to define the Obama administration, but Souza is there to document it, every step of the way. Find lesson plans and supplemental material on The President's Photographer. Browse a photo gallery of presidential images. Own this DVD to follow the President's photographer inside the Obama White House. © 2010 National Geographic Television. All Rights Reserved. Photos courtesy of Erin Harvey/National Geographic Television.